Orders arrive in just 1 or 2 days to 95% of lower 48 state locations. View Details & Map. ELEY products are backed by an industry-leading 10-YEAR, No-Leak, No-Break, No-Rust guarantee! View Warranty Policy. Take a month to put our products to the test. Full refund if not satisfied. Never any restocking fees. Read Return Policy. Small-town roots shape our cusomter-care attitude. Midwestern hospitality at its best. Visit Customer Support. We hear it all the time. Quality-minded consumers have grown weary of cheap, disposable garden hose reels, garden hose and watering tools. They're ready to invest in durable and dependable products that will endure for years instead of months. Good news. The search is over. 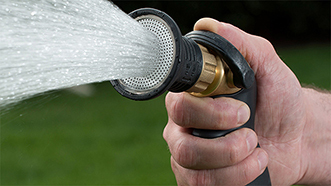 Made from extreme-duty brass, aluminum and stainless steel, Eley garden hose reels are drinking-water-safe and specifically designed for those who seek rugged durability and years of reliable performance. Backed by a 10-YEAR no-leak guarantee, Eley polyurethane garden hoses are kink-resistant, drinking-water-safe, light-weight, cold-weather-flexible and the most durable water hose you'll ever use. 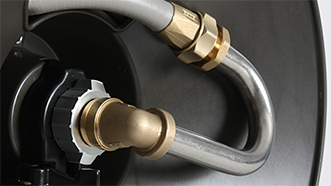 Accessorize and upgrade your watering system with commercial-duty and cutting-edge watering tools such as, spray guns, and ball valves, and quick-connectors, and ground hose guides and more. For us, it’s all about dependability. Eley Corporation, [pronounced 'ee-lee'], is a Nebraska-born, family-owned company that has been producing premium quality hose reels, garden hose and watering tools since our start back in 1990. With deep roots in small-town values, the Eley brothers have focused on revolutionizing the outdoor watering market with a Midwestern-style approach to product quality, performance and customer support. 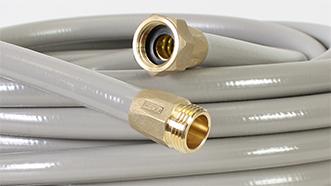 Building on these principles, ELEY has grown into one of the most recognized and respected hose reel brands in North America. See more videos about Eley Corporation. See more videos of Customer Testimonies. Eley professional garden hose products will make your watering system the envy of the neighborhood. Custom design your lawn and garden watering needs with the most durable products on the market, backed by an industry-leading 10 year warranty. Start here, by exploring some of our most popular garden hose reels, garden hose and watering tools.